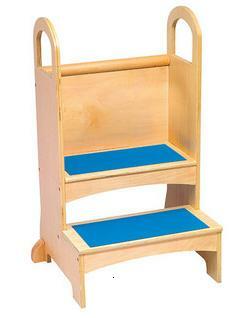 Constructed of birch plywood, this sturdy step stool is designed for home areas that are a little harder to reach for kids. Great for a kitchen, playroom or bathroom. Builds confident climbing skills. Features hand holds to assist in climbing up and down, side panels and textured, non-slip stair treads. Safely supports up to 125 lbs.